"Why don't they finish the buildings? "What happened to all of the buildings?" "Was there a war here?" Apparently, the appearance even bothers President el-Sisi. About two weeks ago, he ordered that the buildings should be painted. I now have a bet with a friend that my president will get his wall built before his president gets his bricks painted! The redbrick construction is characteristic of what is known here to the academic and government community as the "informal settlements." These are areas that have sprung up without architects, formal planning and even such formalities as building codes and inspections. 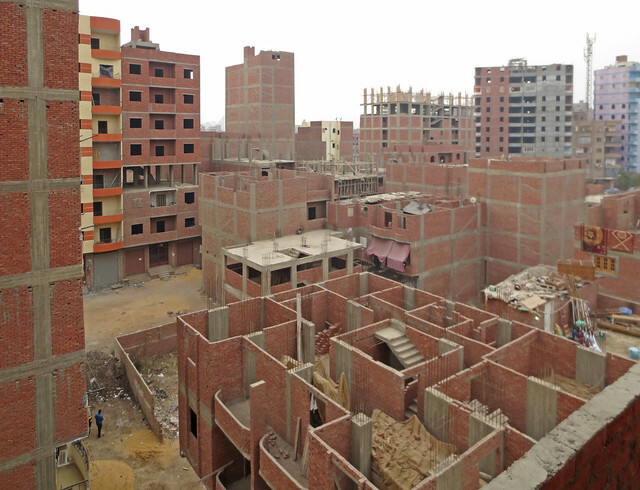 By some estimates, "nearly two thirds of Greater Cairo Region's population are living in informal urban settlements, and the number is expected to continuously increase." The architectural and urban planning communities have gone so far as to hold a three-day seminar here a few years back titled "Learning from Cairo." According to an article on the Arch Daily website, "... informal modes of development can no longer be ignored nor labeled as something to be tolerated until they can be removed." Meanwhile, if you would like to study the subject yourself, just click on the construction tag beneath this post and take a tour of my previous blog posts on the subject. 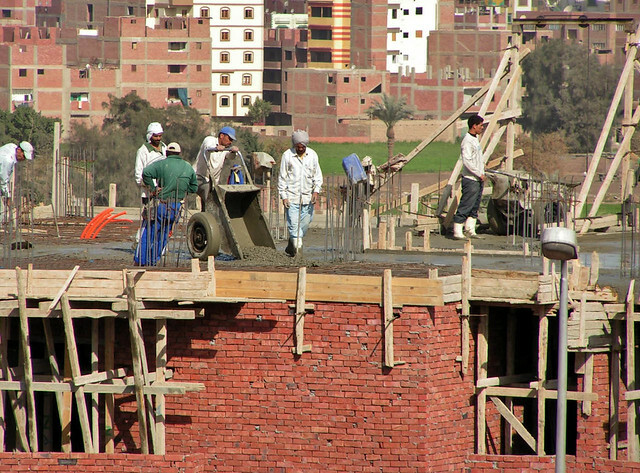 Keep in mind that this is all it takes to build your own high-rise in Cairo. 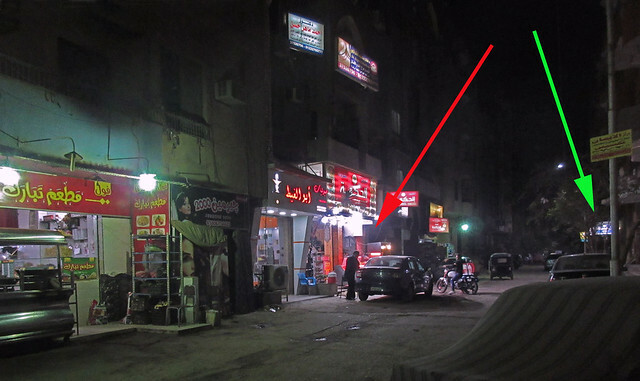 When I went to bed late last night, I noticed one of the familiar sounds of Cairo. "Varoooooooom" - a few seconds pause, then "Varoooooooom." A sure sign of new construction. I showed you the details of interior construction just about four years ago in this blog post. There I featured the rough shell of apartment buildings that look like this as they rise about 8 to 12 stories in the air. 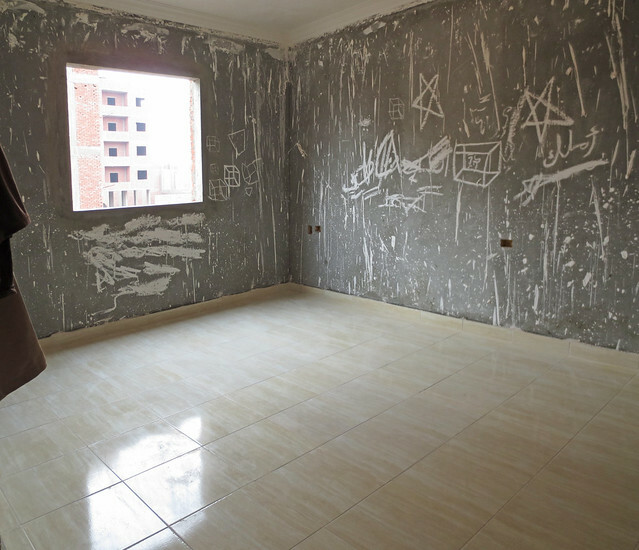 The interior surfaces are finished with a sand/cement mixture to form smooth surfaces and the floors covered with ceramic tile. But how does all of that sand and cement get to the higher floors? There is no freight elevator. A construction crew working on, say, the fifth floor sets up a baby crane on the balcony (almost all apartments have a balcony) and lowers a bucket to a crew at street level who load up the bucket. Up goes the bucket, out pours the sand. Repeat. Repeat. Repeat. When I woke up this morning, the crew was still moving sand so I made a video. Click on the triangle in the center to play it. The five-man crew has this process running very smoothly. Thursday night is an ideal time to begin this sort of work on a busy street. This is the beginning of the weekend and there will be no traffic on Friday morning to cause problems. Of course, we have cats at the apartment again. It wouldn't be Egypt if there weren't cats. One of my favorite parts of having cats here is naming them. I have to know them a bit before I can decide on a name. Did the same with my US cats. It might be a physical characteristic, personality or action or just a whim. This year we have 4 cats so far. Maybe the word will spread that there is good food on the 8th floor. 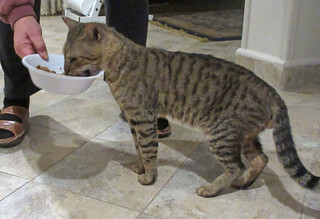 We have Cinder, the dark gray male tabby, the color of cinders. He's so vocal and loud about his request for food. He allows petting but doesn't hang around much. He has business to attend to, mostly outside the building. We've seen him outside the building. He saw us, recognized us and followed us into the bldg. 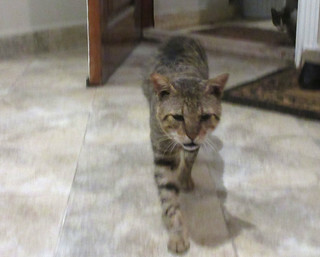 We took the elevator and he took the stairs, yowling all the way. 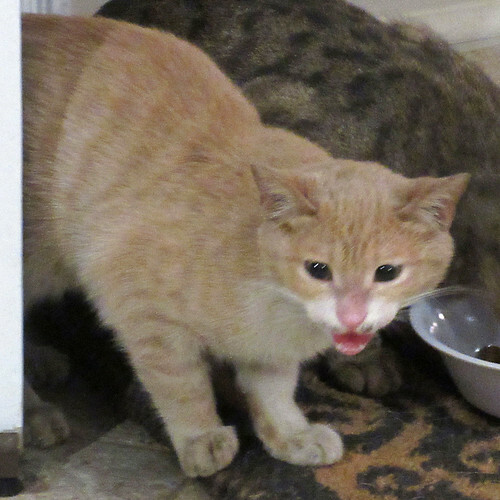 He was fed when he appeared at our door. SMART cat! Just look at that king-like stride. 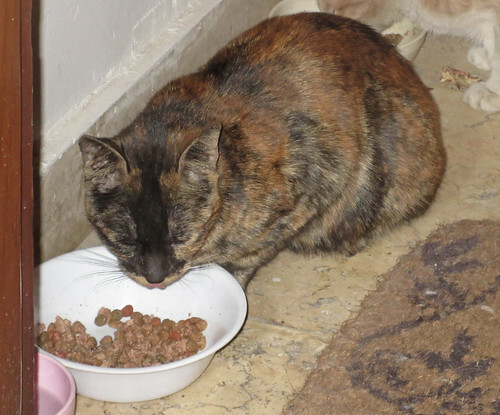 We have Stormy an adult female, mixed black dirt and sand colors, as if she's been out in a storm. She's a real sweetheart. She will come inside while I prepare her food and then likes to hang around the apartment for a while--say a half hour or a little more. We have to leave the door to the hallway open so she knows there's an escape route. She won't let us pet her but she rubs on our legs while preparing her food. Then there's Penny, a young female cat. Penny is named for her color, an orangeish-redish color. Penny is a scaredy cat. She peeks around the doorway when it's left open but dashes away at the slightest noise. She has come into the apartment but is on the lookout for scary stuff to happen. 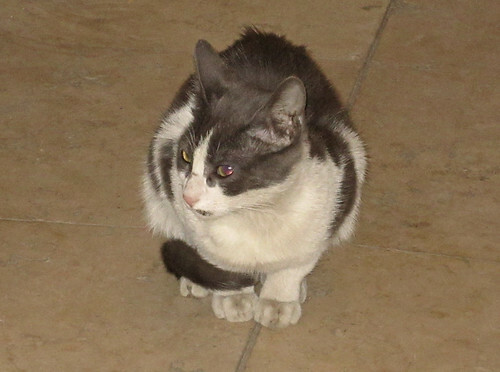 Graycy is a young gray cat. She may be a sibling of Penny and is about the same size. They can usually be found nestled together just outside our door. A little less of a scaredy cat than Penny but always on the lookout too. Graycy is more courageous than Penny and will often come into the kitchen while I'm preparing the food. 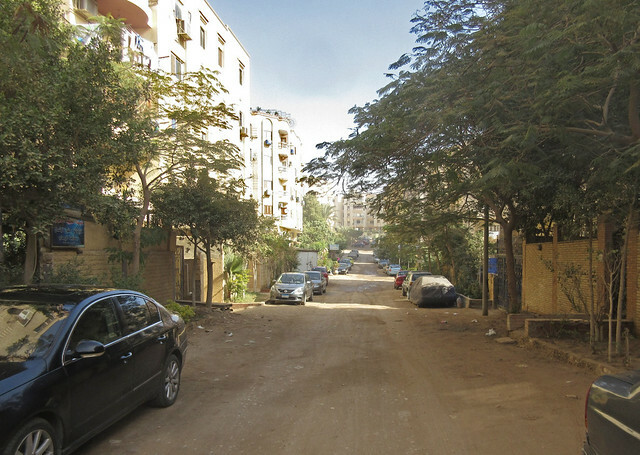 We never know where we might end up when we go out for a walk in Cairo. Yesterday, we passed by the neighborhood souvenir shop and ran into our good friend, Hussein. He had been talking to us about his new restaurant venture and really wanted us to see it this month during its "soft opening." He picked us up after finishing up his day job and drove us over to the restaurant site in Maadi. Wikipedia describes Maadi as an affluent, leafy suburban district about seven miles south of Cairo along the east bank of the Nile. 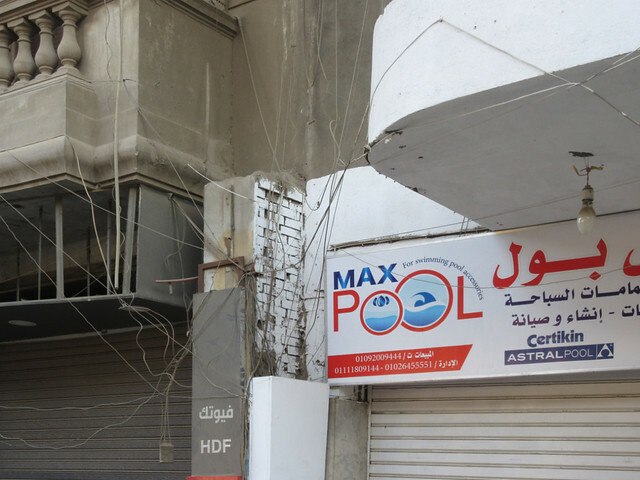 Think "old money" for the locals and "European style living" for the ex-pats who are assigned to work in Cairo. The Corniche provides a delightful walk along the bank of the Nile in this area. Maadi is also home to Egypt's Supreme Constitutional court. 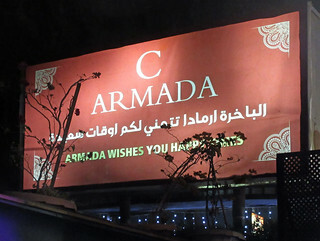 Right across the street from the court building and adjacent to the corniche lies a huge former Nile cruise boat, the c Armada, anchored and home to several restaurants. Hussein along with members of his family with many years of food and beverage experience are engaged in a "re-boot" of this facility. We were immediately taken aback at the scale of the site. This must be one of the largest "boat restaurants" along the river. These are popular dining spots. You can find T.G.I.Friday's, Johnny Corino's and Chili's in similar floating venues. There are multiple dining areas among the five decks including spaces suitable for wedding receptions and large groups with buffet service. 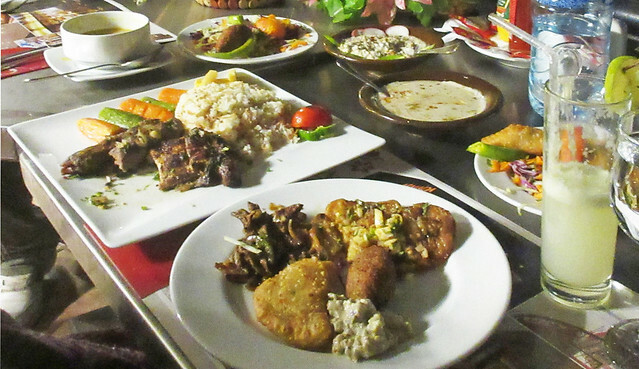 Hussein and family plan to offer some Turkish, Indian and Lebanese items as well as the traditional Egyptian fare. We sat out on a quiet part the deck overlooking the Nile and had an outstanding round of Lebanese appetizers along with our main course. Dinner fit for a pharaoh! Just a mile or so west of the Great Pyramids, as the road bends to the south toward Fayoum, lies an area of housing known both as Pyramids Heights and Hadaba. 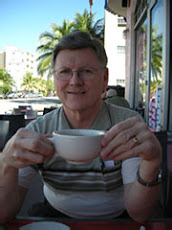 We had been invited to breakfast with a friend in Hadaba. This community has homes priced mostly in the $200,000 to $400,000 range - considerably upscale from our area - but not quite in the "New Cairo" range. There is a wall separating this hilly area from the highway on one side and no development on the pyramid side. Many properties do have a pyramids view. The area is old enough that there are trees lining the streets. The home we were visiting had a nice garden area with trees and plants where we sat for breakfast. 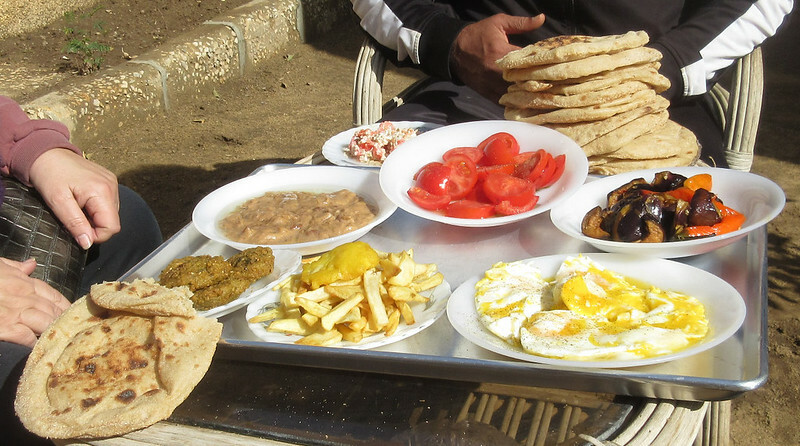 This is Egyptian cuisine at its finest - clockwise from the bottom center: french fries, falafel, fuul, "old cheese," tomatoes, eggplant and fried eggs. All served with plenty of fresh local bread. The eggplant plate has some very hot peppers that can be added as necessary. The morning temperature was only 65 degrees but soon felt too hot in the sun so we moved underneath one of the owner's mango trees for tea, coffee and conversation. Of course, I can't sit underneath the mango tree without thoughts of Ursala Andress and Sean Connery in Dr. No as I hum the tune. Does this give away my age or does every James Bond fan think of this? New Cairo is one of the new cities, which have been built, in and around Cairo to alleviate the congestion in downtown Cairo. It was established in the year 2000 by presidential decree number 191. ... The city could eventually host a population of 5 million. 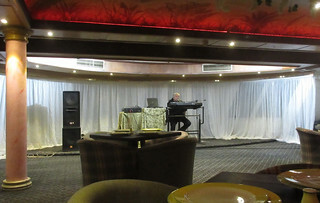 Some people say that the population living here is the "Creme de la Creme" of Egyptian society. I can't vouch for the accuracy of that claim, but I didn't see any donkey carts roaming the streets. Most of the housing lies inside what we would call gated communities. The route to New Cairo from the city is lined with modern office buildings. One side appears to be mostly financial and technology companies while the other side offers retail and commerce. 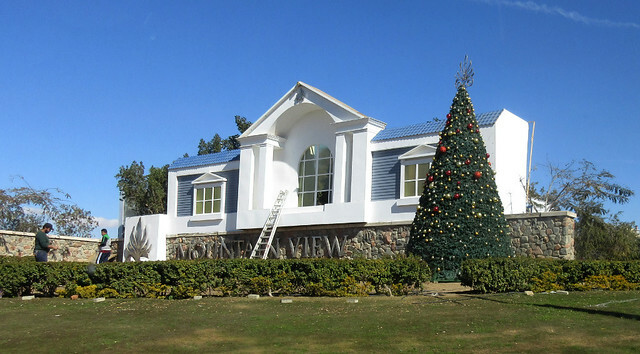 We noticed that workers were just taking down the Christmas decorations from the facade that advertises one of the larger housing developments, Mountain View. Shortly after "New Cairo" was announced, American University in Cairo (AUC), German University in Cairo (GUC), Future University and other institutions established their facilities there. 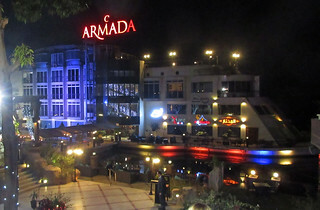 We arrived at our destination, the Point 90 Cinema and mall located near the AUC campus. If you check the movies playing at the Cinema today, you will find a choice of sixteen including Aquaman, Mary Poppins Returns, The Grinch and Creed II. 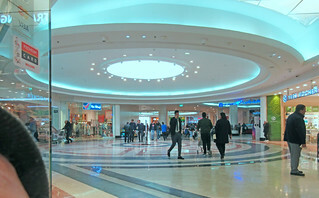 Just as most of the movies probably sound familiar to you, the mall would look similar to any at home. This view shows a bakery on the right, a jewelry store on the left and down the aisle you can just make out Bath and Body Works. We were meeting our young friend, Moody, who has been mentioned on this blog several times in the past. In 2007, Moody lived with us in Bloomington and attended Kennedy High School for a semester. Moody has finished university, traveled the world and formed his own business - Kira Productions - and is now a media producer. 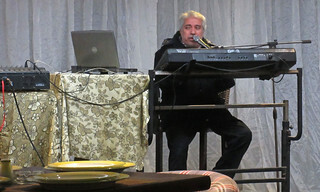 We had lunch with Moody at a nice Lebanese restaurant in the mall and he updated us on his recent life. 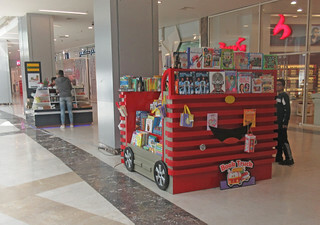 Walking around the center court of the mall, I spotted a small book cart containing mostly English language works. 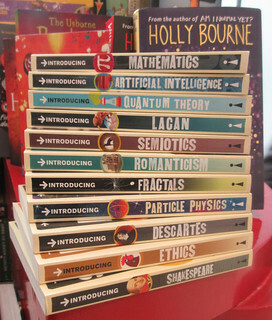 This stack of "Graphic Guides" caught my attention. If you have been looking for an introduction to Fractals but though the concept was too esoteric, this may be for you. Check it out on Amazon where you can look inside. 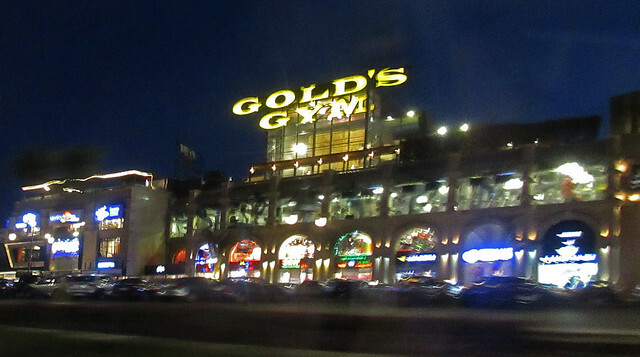 In the evening, when we were leaving New Cairo to return home, I noticed a large "Golds Gym" along the street. 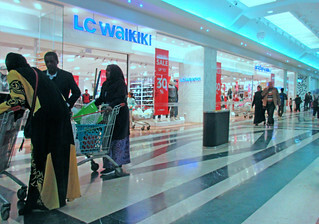 Gold's is an international chain with numerous facilities here. This is the largest one we have seen. As you can see from the previous post, we buy most of our food items in the neighborhood shops. We love walking down the street, exchanging greetings with the shop owners - even if we are not buying - and just visiting. Our neighborhood has a bit of a village feel to it. But we do go to the larger supermarket shopping centers for some items. The local vegetable market does not have mushrooms and the local Ragab Sons supermarket does not have a wide selection of baking supplies and frozen meats. You also won't find a good selection of appliances or televisions nearby. 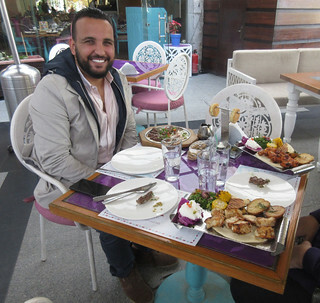 For that sort of thing, we make a trip across the river to the upscale suburb of Maadi or downtown. 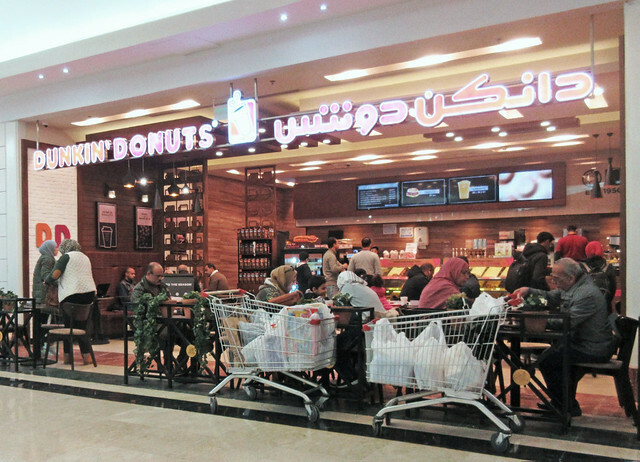 Here you can see some shoppers relaxing at the Dunkin' Donuts shop after they filled their shopping carts at Carrefour. Other shoppers are noting the bargains on sale and enjoying the food court. McDonald's golden arches are just visible in the background. In spite of encouragement by friends here, we had not yet begun using Uber as an alternative to the local taxis. Part of the reason was that without a local smart phone, it was hard to do. 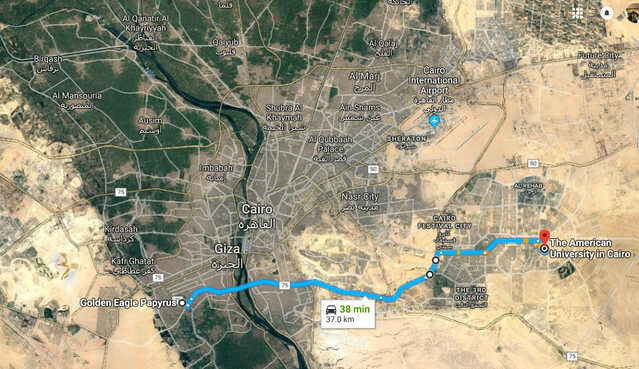 Today we were headed across the river to New Cairo, on the eastern edge of town, about 23 miles away. I downloaded the Uber App on the smart phone brought from the US. We were headed to the Point 90 Cinema shopping center which popped up almost immediately as I keyed in "poin..." Of course, the app knew exactly where we were and it estimated that our driver would be here in six minutes. Taxis are getting hard to find here on weekends so that worked out well. Our Uber ride was much newer and more comfortable than the usual taxi. 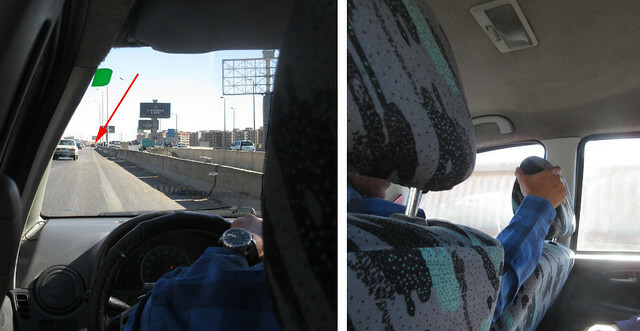 The driver was right on schedule and we headed east on the Ring Road, the six lane freeway that encircles greater Cairo. 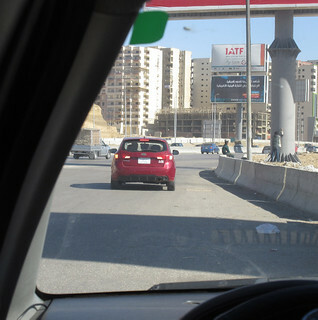 We hadn't gotten too far beyond our usual City Center exit in Maadi when the driver began slowing to a halt. "Is there a problem?" I inquired? "No, I missed the turn," he replied as he began backing up. - he was about a half mile past the exit ramp onto the access road. Now you might think backing up on the shoulder of the freeway is unusual. I know the Minnesota State Patrol does - I know from personal experience that they don't even like you driving forward on the shoulder. Here, we have a more relaxed attitude toward many things. In this picture, you can see our driver is backing up quite smoothly. Ahead in the distance, note the red car who has also missed his exit and is backing up too. It was only a few minutes until we reached the exit ramp onto the parallel access road. Note that the red car has been backing faster and has caught up to us. Clearly, we have the more cautious driver. Later in the evening we made the return trip in heavier traffic in about 50 minutes for $5.75 Our waiting time for a driver was only 1 minute. We will be Uber customers regularly now. 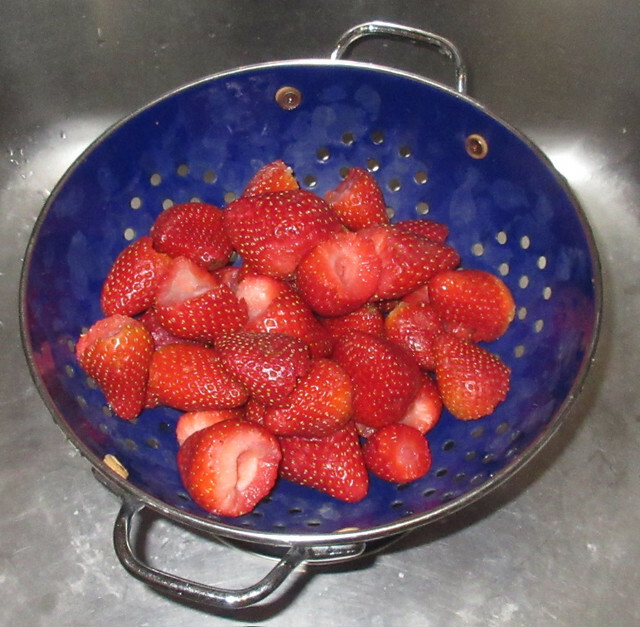 Strawberries are always just coming into the local markets when we arrive at the beginning of January. We didn't see any that looked quite ripe as we browsed the local shops, but two different friends brought us some as Egypt homecoming gifts! On our second evening here, we made a few stops at neighborhood shops. One of my first stops is always at our favorite neighborhood bakery, about a half-mile away. Pictured here about six years ago, our baker always has a friendly greeting for us - and by far the best sweets that we have found anywhere in the city. A bakery here doesn't sell normal bread, just bread specialty items. We made three stops that evening along Heckma street. 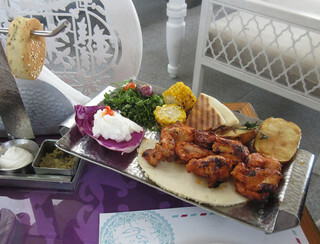 Heckma Chicken has the best grilled chicken we have found here - Red arrow. 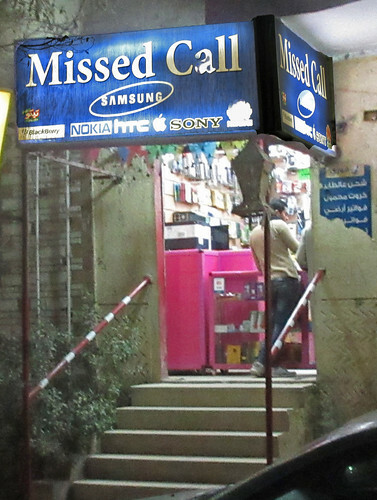 The green arrow points to a tiny telephone store where we picked up a new battery for Linda's very old Egypt mobile phone. Farther down the block there is a small grocery where we found New Zealand butter. 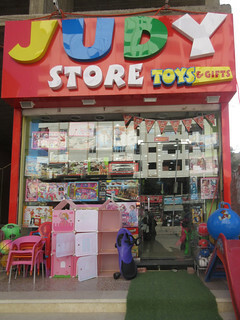 New to the area this year are a carpet store, not pictured, and this interesting toy shop. We will have to explore these places later. Back at home, we were greeted by the electric company's meter reader who presented us with the monthly bills for last March, April and up to the current date. The fresh green peppers came to 35 cents. The three delicious sweet rolls from the bakery totaled 45 cents. And the past ten months electricity totaled almost exactly ten dollars. I am so glad Egypt has not developed the American practice of charging thirty dollars per month just for being connected to the line with no usage! That's what we pay to East Central Energy to keep our cabin (in Gordon, WI) connected to electricity. We take so many things for granted back home. Like water - you just turn the tap, and there it is. 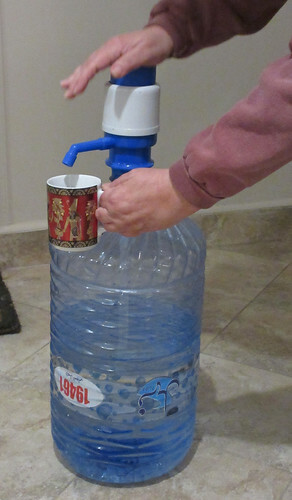 We had water in the Cairo condo when we first arrived. Opening the condo is a bit like opening the cabin in the spring back in Wisconsin; turn on the gas ( we leave it turned off at the main valve near the meter), get the heat going (we have two small electric space heaters), then turn on the water and see if the water heater works. This year, the water supply went off after a day - and stayed off for most of the following day. Back on for a couple of hours - then off again. Repeat. We have never had this problem before - maybe an hour's interruption but not a major outage. It takes a while to ferret out the real explanation of anything in Egypt. Worse yet, things are always going to be "fixed soon." I knew we had a nice new pump for the building - our HOA fees increased from $7 a month to $10 a couple of years ago to cover the replacement and re-plumbing. I could hear the pump running, grinding somewhat, since it was not drawing any water. 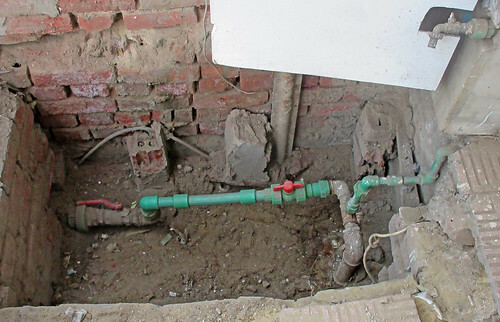 When we asked about the situation, broken pipes were mentioned along with neglected shut-off duties. 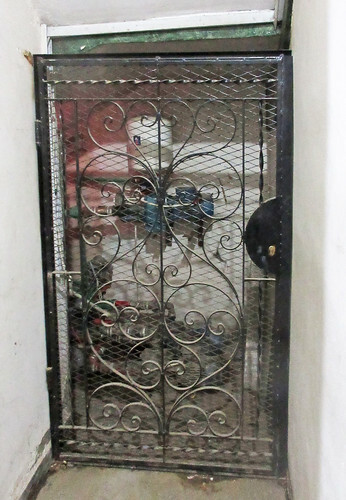 Our water supply system consists of a small pump in the building lobby that supplies a small stream of water to a tank on the roof where gravity does the rest of the work meeting resident demand. For some unknown reason there is occasional manual intervention to either start or stop the pump. The reason for this is not at all clear. 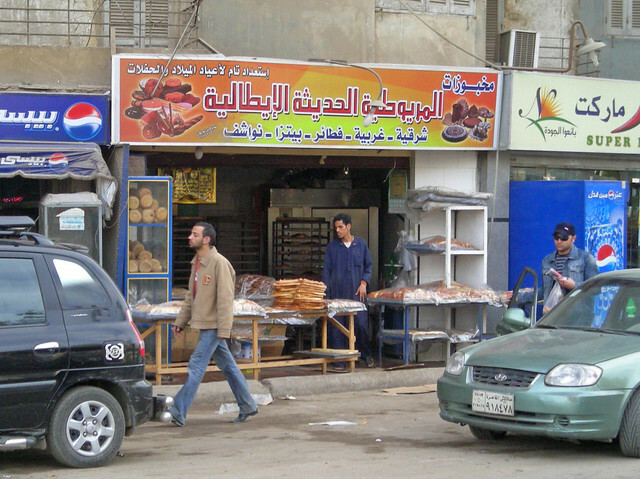 In Egypt there are many things that are unclear to both us and locals. After much detective work, the main problem appears to be inadequate water supply to this whole area of Giza. We are surrounded by many buildings that have sprung up "illegally" following the revolution. (They didn't have permission to build.) The buildings have hooked into the limited water supply and as more residents appear, water demand has exceeded supply. Now, we might think the solution is to increase supply but here, each building adds a booster pump outside to increase their share of the available water in the pipe. We are the only building along the street that does not have this booster pump. It appears that the residents of our building have come to accept water outages as the new normal. Our immediate neighbor across the hall supplied us with a pump and water suitable for washing dishes, hands and flushing the toilet. A full 1.5 liter bottle will also do the trick but why should we pay for water to flush? People here are resourceful as well as generous, friendly and helpful. The photo shows how the pump works. It does not suggest that we will drink the water. We don't know the source. This hole just outside our building is to be the location of our new booster pump. It is right next to the telephone wire box shown in previous posts. If you think this is all a bit crazy - and perhaps even fake news, let me suggest some reading. There is a wonderful book titled, Understanding Cairo: The Logic of a City Out of Control by David Sims, that I recommend if you want to learn more about the "informal city." To get a shorter and less academic overview, follow this link. This is part of my traditional, "Will my iPad etc. work in ... " series. You can see others by clicking on the "Internet" tag below this post. We have long had three mobile phones here in the Cairo condo. Linda and I each have a cheap "people's phone" made by Nokia. Linda also brings her trusty Motorola "Flip-Phone" (shown above) from the 1990s which runs on the T-Mobile network at home. We were connected - but "left out" as all the young people surf the net while we couldn't. Linda upgraded this year to an iPhone at home and in anticipation of our trip to Egypt I visited Best Buy in Bloomington and sought out an employee who "can talk about unlocked GSM phones, interchangeable SIMs and phone frequency coverage." I was quickly steered to "the guru." 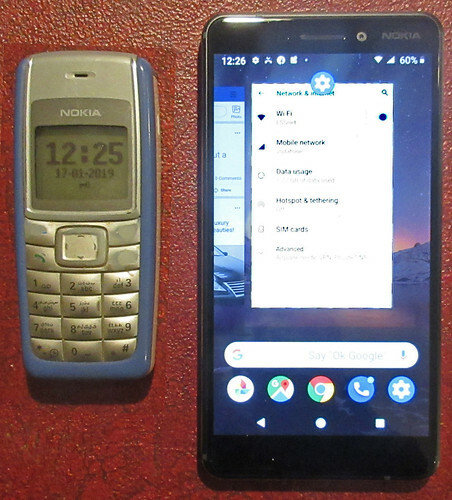 I soon settled on the Nokia 6.1 with dual SIM. So now we have Linda's iPhone which runs on T-Mobile and maintains connectivity here via the local Vodafone voice/text network. She gets to use its data capabilities via her WIFI connection in the condo. One of the great features of the new phone is that I can use it as a mobile "hotspot" for our other devices when the DSL Internet connection is down. So, to summarize: When you come to Egypt, bring a GSM phone (This usually means one that works on T-Mobile or AT&T in the states.) You will have connectivity via your carrier's international roaming policy - this can be quite expensive. If you intend to use the phone a lot, make sure the phone is "unlocked." You will need to verify this with your carrier. Then go to a major Vodafone store when you arrive and get a Vodafone SIM with a local phone number, have them install it in your phone and test it. You will need to bring your passport - not a copy! By the way, we chose Vodafone because they have a good store in the neighborhood and appear to be the dominant carrier, with 4G network service in many places. There are other carriers. With my dual-SIM phone I can even use two of them interchangeably. As was the case last year, when we hooked up our phone, there was no dial tone. That meant no DSL connection to the Internet. Our telephone man could not immediately access the roof and track down the broken wire. He naturally wanted to take an easy solution and run a new wire out the living room window and down the front of the building. I objected strongly on the advice of my interior design consultant, Linda. We soon got the building bawaab involved (more money!) and managed to get the telephone man up onto the roof. The wire, of course, was broken somewhere near where the Safety Door sign was ripped out. A few feet of new wire were spliced in and we had dial tone. The DSL connection was established after the passage of another day. Of course, it disappeared about once a day for the past three days. I am optimistic that we will stay connected now - but I am one hell of an optimist. 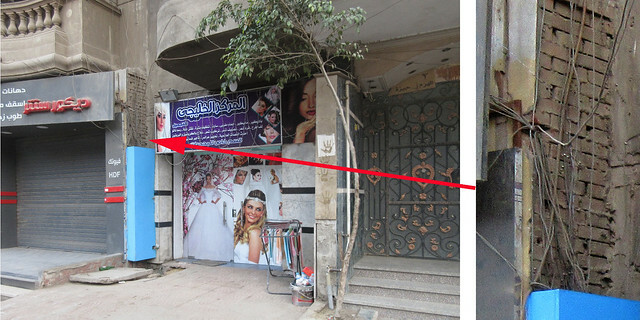 A look at the current wiring reveals much about Egypt. Yes, those are all telephone lines. The light bulb dangling by twisted wires hanging below an opening in the balcony is normal practice here. 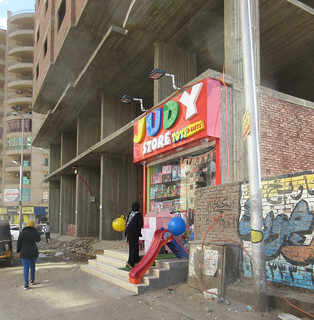 Sometimes I have been asked if Egypt has building codes. It is hard to explain. Surprisingly, this was not our biggest problem. I will talk about water tomorrow. 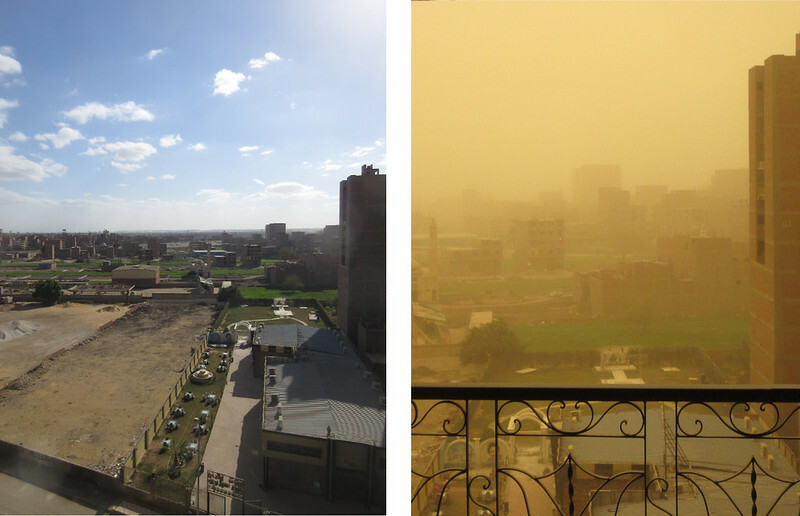 What's the weather like in Egypt is a frequent question we hear. 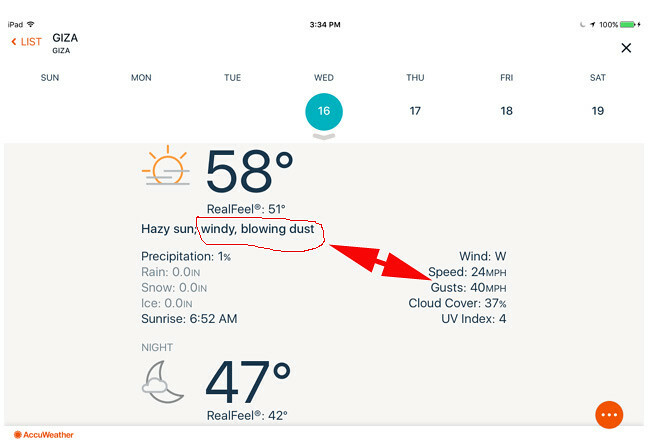 I usually describe it as "about like the weather in Phoenix." Checking on Accuweather today I see that Phoenix will have a low of 48 and a high of 67. Our thermometer here in Cairo registered an overnight low of 48 yesterday and a high of 68. I'd say that is pretty darn close! When the wind blows here in the winter, the fine sand of the Sahara turns the sky to a golden glow and cools the temperature. Do not go outside! Breathing the dust is unpleasant and it gets into places you would never imagine. Here is a photograph from our back balcony a couple of days ago alongside one from this afternoon. The weather forecast describes the situation this way. After a few hours, things have begun to settle down. This usually happens a couple of times each winter during our stay - but usually in late February or March. I guess you would call it unseasonably sandy. We are frequently asked, "how long is the trip to Egypt?" The short answer is, "About twelve hours of flying time." But the agony of the trip is in how those twelve hours are distributed! 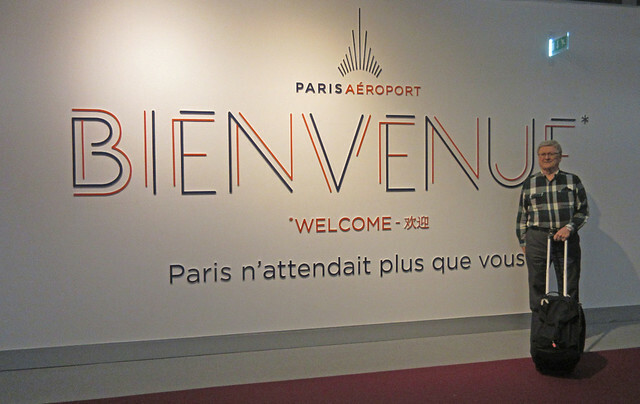 After extensive research, Linda got us a good deal on a Delta/Air France flight plan that took just about 24 hours, thanks to an eleven hour layover in Paris. There was a cheaper fare that took 36 hours but there's a point where the trade off of money vs time goes in favor of time. We headed for the airport at about 1:00 p.m. I only had about a half hour to pack prior to leaving due to my poor preparation habits, ie. procrastination. All of our flying was at night so I don't have any pictures this year of the arctic ice pack or the Alps, etc. 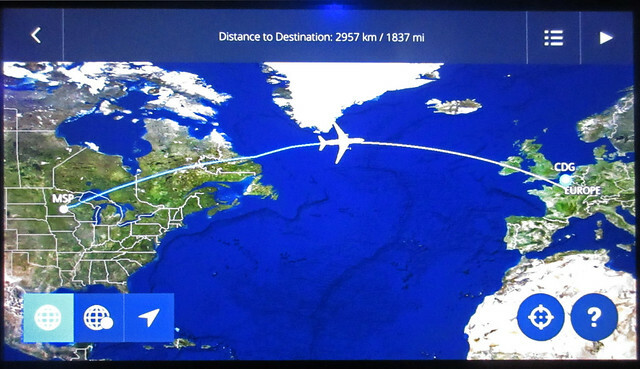 We had a nice tailwind which gave us a mere seven hours and eighteen minutes flying time to Paris. We flew a bit more southerly route than usual. Most people watch movies, I watch the flight info and read the newspapers. We had seats in row 55 on the Boeing 777. Who knew there were row numbers that large? Which airline will be the first to squeeze sixty rows onto a plane? In Paris, we changed terminals at Charles De Gaulle airport requiring another run through security before ending up in Terminal 2F. 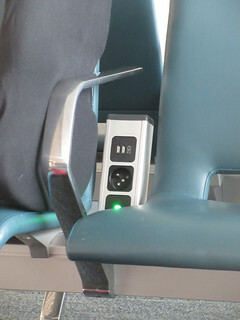 This terminal is still undergoing some remodeling but the seats in the waiting area all have good electrical connections - a far cry from a few years back when travelers shared the secret outlet locations in airports around the world. The food situation in a country known for its cuisine, was dismal - $8 sandwiches are available. 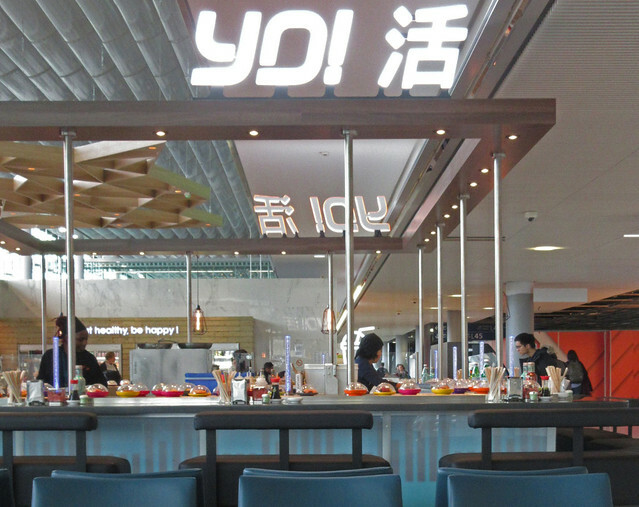 But the restaurant highlight in our waiting area is the YO! sushi bar, part of a small Paris chain. Reviews on-line range from excellent to awful - with more tending toward the latter. But the entertainment value of the dishes rotating along the counter earns high praise. It surprised us how many Westerners sat here and ate their food with great ease using chopsticks. I have posted a 30-second YouTube of the show below since still photos don't convey the real atmosphere. To play it, click on the triangle in the center of the second photo. 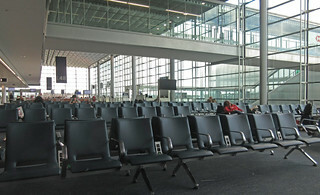 Much of the day this area of the terminal is quite empty. 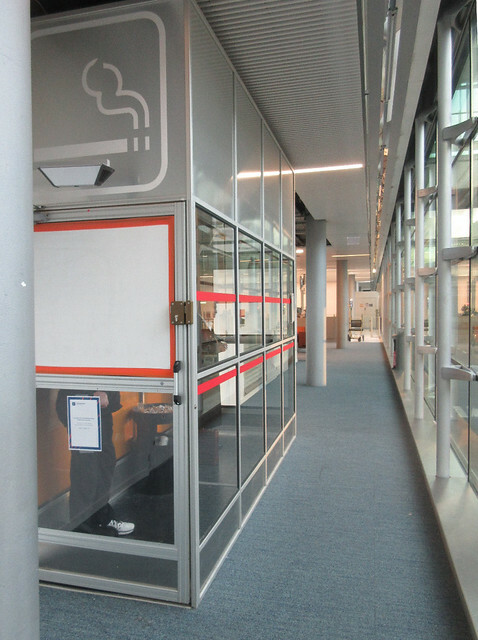 Our gate for the flight to Cairo always seems to be down at the end where the smoking booth is hidden away and that's always a good opportunity for people-watching. The second leg of the trip is about four hours from Paris to Cairo. 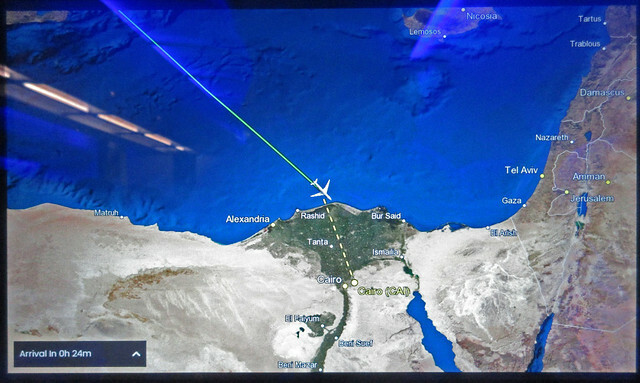 It had been about 36 hours since our last good sleep, so we both caught a good nap on this flight, waking up as we approached the Egyptian coastline. Cairo now has a first class modern airport terminal. 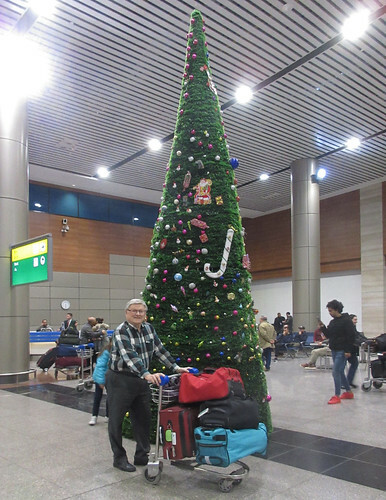 We bought our visas on arrival for $25 apiece, cleared customs quickly, found our bags and were outside in short order. 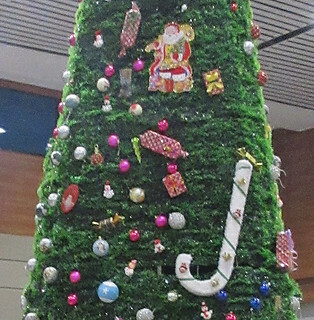 The terminal has a giant Christmas tree with Santa Claus featured prominently. They don't quite have the candy cane right, though. Christmas here is on the Orthodox calendar (Egyptian Christians have their own pope, too) and so falls on January 6. We arrived at the apartment around midnight local time and did a little shopping at nearby Ragab Sons grocery supermarket, picking up a package of fifteen eggs, some milk and the like so that we'd have breakfast food available upon rising.. "Deck the Halls" was playing over the speaker system in the store, something we find amusing in a store owned by conservative Muslims. Makes us wonder if Egyptian Christians even sing Christmas carols.